My fav sweet and i hope every 1 like this. Heat butter in a saucepan and fry coconut for 2 minutes on low flame. Heat milk and add sugar.Keep stirring and cook until sugar dissolves. Add fried coconut and cinnamon and cook over low flame for 6-7 minutes or until milk dries. Grease a tray and put coconut mixture in it. Level with spoon. When it is at room temperature, refrigerate. Garnish with almonds and pistachios. Cut into pieces and serve. I know its very late reply but i want to thx u allz who like my recipe. instead of cinnamon powder can elaichi powder b ok?? plz reply. Hi ! 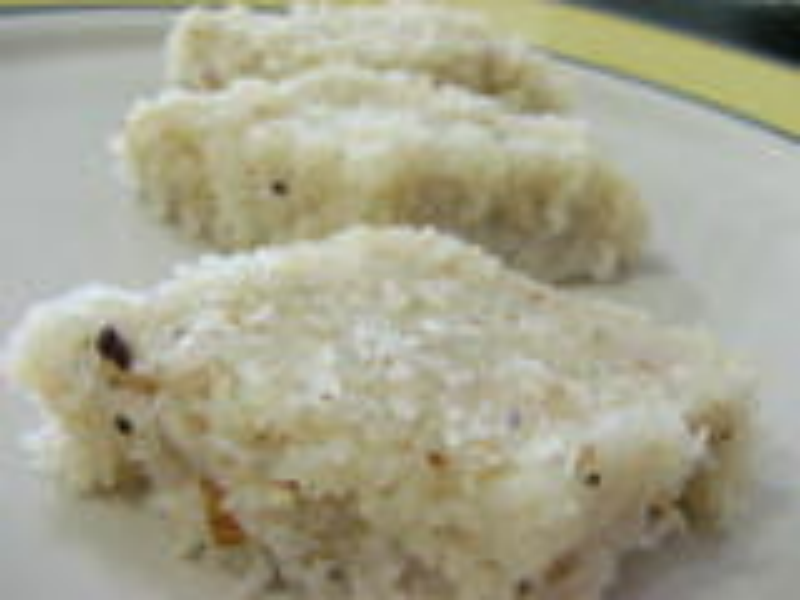 Salma , Very Simple but very yummy Coconut sweet . Dis is my favourite too . Thank U. Coconut is highly nutrious and rich in fiber , Vitamins and Minerals . It functions as a protective antioxidant . Try this with fresh Coconut it's more Healthier .